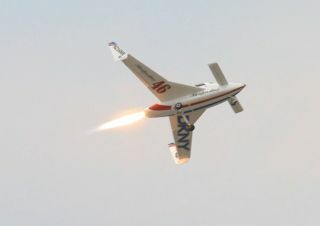 The DKNY Bridenstine Rocket Racer in flight on July 29, 2008 at EAA in Oshkosh, WI. A rocket-powered racer will take the skiesagain for the air show crowd at Oshkosh, Wisc. this weekend, fresh from itspublic debut on Tuesday. Veteran pilot Rick Searfoss pilotedthe ship — powered by a liquid oxygen and kerosene rocket engine developedby XCOR Aerospace — through a straightforward flight pattern on Tuesday thatlasted approximately ten minutes from takeoff to landing. "Everything went exactly as planned,exactly as practiced," said Granger Whitelaw, co-founder and CEO of theRocket Racing League. "It performed exactly as we had laid out for theflight." Whitelaw, a veteran of the Indianapolis 500,joined with Ansari X Prize-founder Peter Diamandis to foundthe Rocket Racing League in 2005. The men envisioned combining humanspaceflight with NASCAR-style racing in the sky, and have planned a series ofevents this year showcasing the new sport. The league boasts six teams on its rosterunder title sponsor DKNY Men, a New York City-based men's sportswear line thatis also backing the Bridenstine Rocket Racing Team headed by former U.S. Navyjet pilot Jim Bridenstine. Perhaps the only hiccup during the firstpublic flight came from the intentional engine cutoff — a sound that variousobservers have described as a burp or bark. The racer lit its engines six timesfor 15 to 35 seconds, shutting it down abruptly after each time to glide. Additional single-ship exhibition flights areplanned for Friday and Saturday at the EAA AirVenture air show in Oshkosh.,where an expected 700,000 spectators will have the opportunity to photographand examine the Bridenstine racer. "It'll be much closer to a lot of thefans," Whitelaw told SPACE.com. He added that the rocket planewould also perform some minor aerobatics ranging from aileron rolls toImmelmann turns and half loops. Another racer from a Santa Fe Racing team hadalso originallyplanned to fly this weekend against the Bridenstine racer, but remainsgrounded because the Federal Aviation Administration (FAA) has yet to clear itfor flight. The Santa Fe racer's engine was designed by Mesquite, Tex.-basedArmadillo Aerospace to run on liquid oxygen and ethanol. Whitelaw said he hopes that the second racerwill get flight approval by September, when the rocket planes are slated to competehead-to-head at the Reno Air Races in Nevada. Either way, a new element in the fall willinvolve athree-dimensional track in the sky, which fans could follow on largetelevision screens that show views from pilot helmet displays. The addedimmersion factor could help bring rocket racing one step closer to mainstreamentertainment, organizers said. "We're planning on having the bigscreens at Reno," Whitelaw said. Rocket racing events after this weekend willinclude the Reno National Championship Air Races in Reno, Nev., betweenSept.10-14; XPrize Cup in Las Cruces, N.M., in late October; and Aviation Nation atNellis Air Force Base in Las Vegas, Nev., on Nov. 8-9.